Award-winning photographer Michael Weintrob brings his Instrumenthead Experience to New Orleans during Jazz Fest to benefit the NOMC. Music photographer Michael Weintrob returns to New Orleans during the 2019 Jazz Fest season for a fine-art extravaganza featuring live music. This five-day hybrid art fest & interactive gallery experience benefits the New Orleans Musicians’ Clinic. Joining him for this exhibition is good friend and iconic artist Keith “Scramble” Campbell. This year marks 23 years since the two artists first met, and six years since Weintrob’s last exhibit in the Frenchman district. This also marks Campbell’s first marquee exhibit during Jazz-Fest. 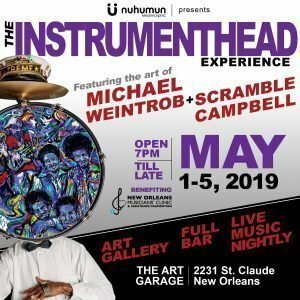 The INSTRUMENTHEAD exhibition will run May 1st through Sunday, May 5th at The Art Garage located at 2231 St.Claude Ave. The event is open to the public at 7:00pm nightly. Festivities kick off in grand fashion Wednesday night, May 1st at 7:30pm with a huge kick-off party featuring performances from an all-star cast of New Orleans musicians including: Clint Maedgen, Roger Lewis, Kevin Harris, Kirk Joseph, Jamie McLean, Big Sam, Terence Higgins, Papa MALI, Bobby Bega and many more! The event is open to the public with a suggested donation at the door, 100% of which will directly benefit NOMC. Weintrob explains, “I am so excited to return to New Orleans to share my work. The city is one of the cultural epicenters of the planet for music, food, and art. I’m honored to be exhibiting my INSTRUMENTHEAD portraits in a way that gives back to the community.”The INSTRUMENTHEAD exhibit comprises a vast collection of striking portraits shot since 2006, portraying diverse entertainers shown with their instruments obscuring their faces. Subjects include: Bootsy Collins, Mickey Hart, Junior Brown, Scott Avett of the Avett Brothers, and Derek Trucks. In the INSTRUMENTHEAD book, Weintrob has captured uniquely intimate expressions of 369 artists and their instruments, without ever showing their faces.